Not so long ago in a galaxy not so far away, the day my husband has been anxiously awaiting finally arrived. No, the kids aren’t all potty trained – I WISH! No, we decided it was finally time to share Star Wars with our boys. My brother has always loved Star Wars and it was a big part of my childhood, so I was excited to share it with them almost as much as Mr Napping. The polling is complete and the results are in: my boys LOVE Star Wars, big surprise. It’s been the only thing to compete with superheroes lately. 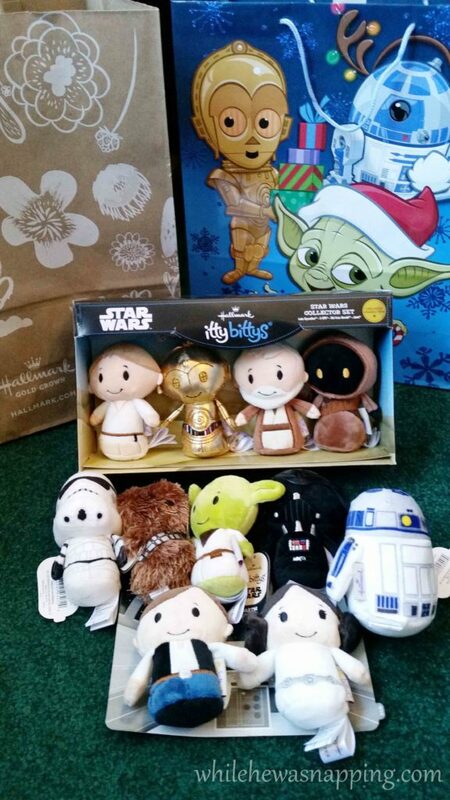 When Mr Napping and I found these Star Wars IttyBittys at our Hallmark Gold Crown store, we knew what we needed to do with them to make Christmas extra galactic! – IttyBitties available at Hallmark. Not so into Star Wars? That’s ok, Hallmark has lots of IttyBittys to choose from. 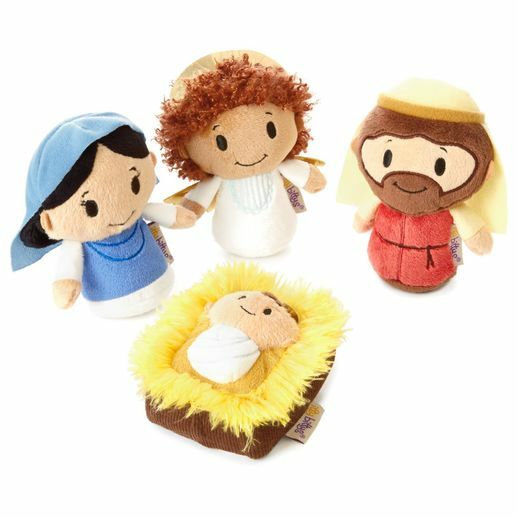 There are nativity set IttyBittys, superheroes, Frozen, Rainbow Brite, winter-themed, Disney Princesses, Peanuts, Wizard of Oz, Toy Story, Finding Nemo, Inside Out, Monsters, Inc., and more – there’s something for everyone. Not all stores carry all the IttyBittys, see the Hallmark site for the complete selection. 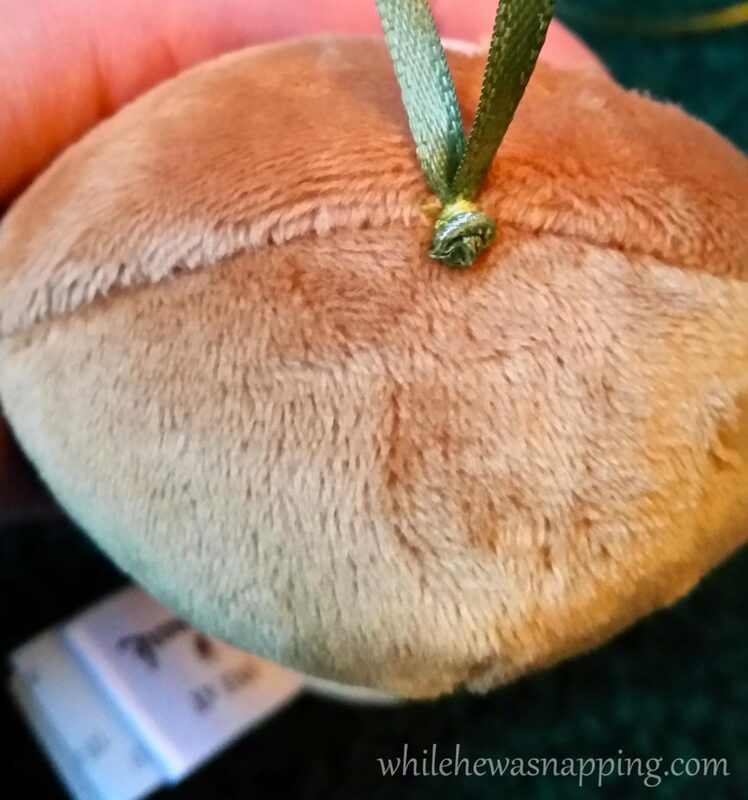 – Cut off a 3-inch length of ribbon. – Loop the ribbon with the ends together and tie a knot in the ends. Trim the ends, but not too close. I trimmed a couple too close and my boys ended up pulling the knots out and I had to re-attach them to the IttyBittys. – Thread the needle and tie a knot in the end of the thread. I actually used the thread doubled over for a little more strength. 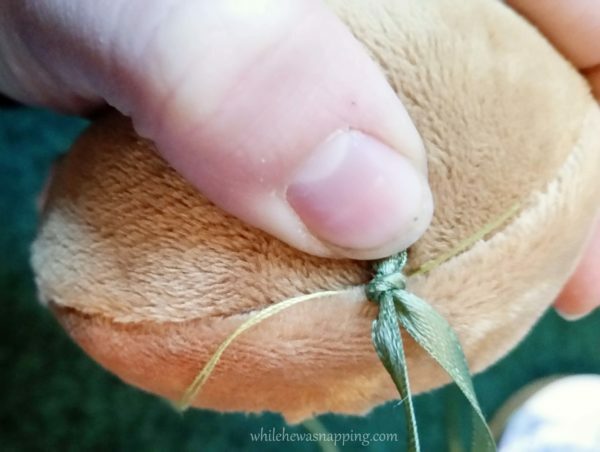 – Attach the loop of ribbon to the top of the IttyBittys with the thread. I just stitched around the ribbon a few times and tied a knot. Trim the thread ends. – Repeat until all IttyBittys have ribbons attached to them. 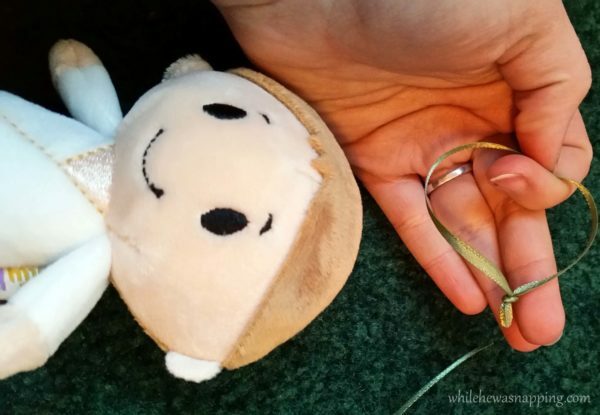 After I attached the ribbons to the IttyBittys, I put them in a fun gift bag (also from Hallmark) and told my boys we had a surprise for them. 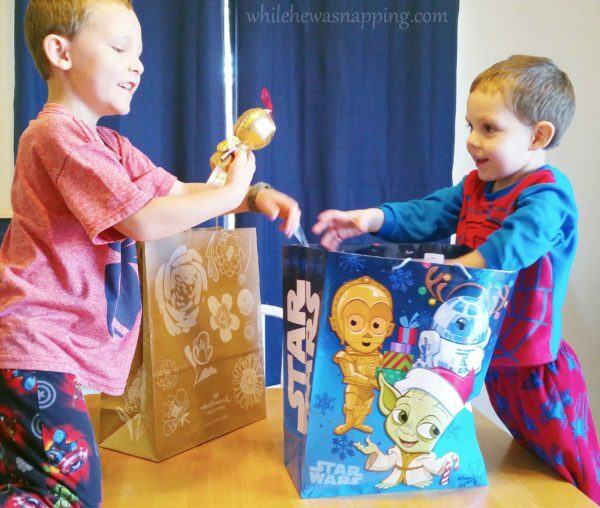 We let them open the bag and then we set up our small Christmas tree and let the boys decorate their hearts out. They had almost as much fun decorating the tree as they did just playing with the IttyBittys. I don’t know how many times that tree has been redecorated since Saturday. We were still missing one thing though. Every Christmas tree needs a topper. 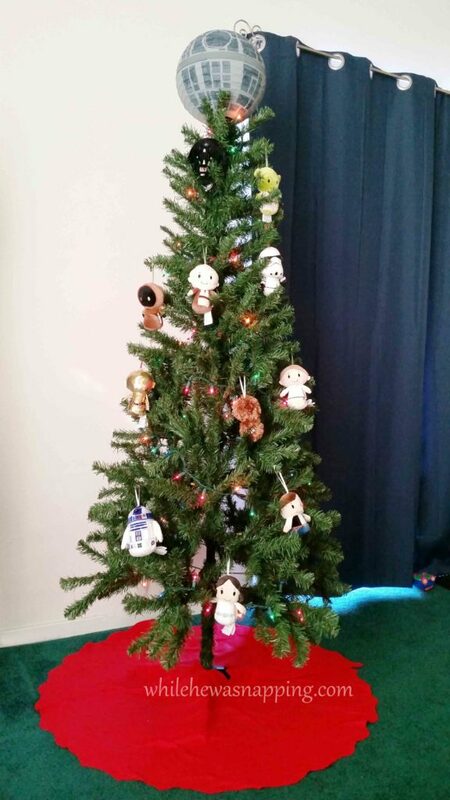 And what kind of star tops a Star Wars tree? Why the Death Star, of course. 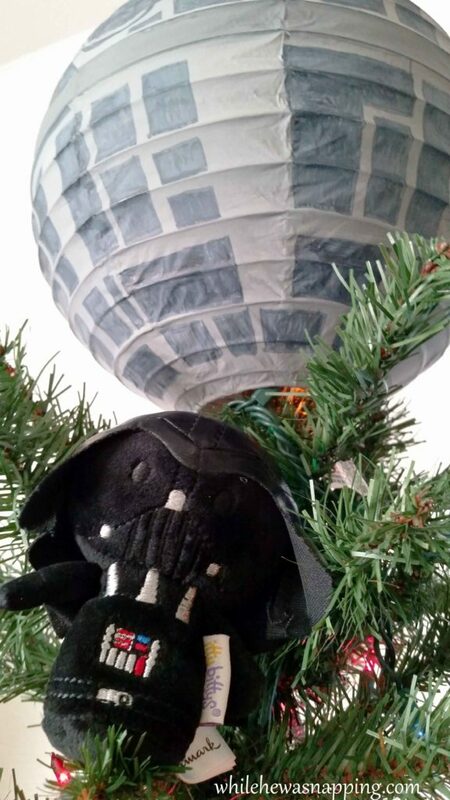 I spent a good chunk of today bouncing between kiddos and making a Death Star to top our tree. We are still adding to our Star Wars tree and we probably will keep adding to it until we take it down. My boys love to play with the IttyBittys and this was such a fun activity to do together as a family. They are still breaking out in the Imperial March every time they see the tree. Mr Napping likes to start humming and then bask in the resounding chorus of three boys. Want to save some time this holiday season? Make Hallmark your one stop shop for your holiday shopping. Check out Hallmark’s new Crafters & Co. line of luxury soaps, teas and candles for decadent gifts to spoil the special people in your life. this holiday season. There are lots of great ornaments perfect for gift giving. Home decor elements are my go-to gifts for my favorite girlfriends and Hallmark has some awesome options. They’ve got you covered for all your gift wrap needs too! 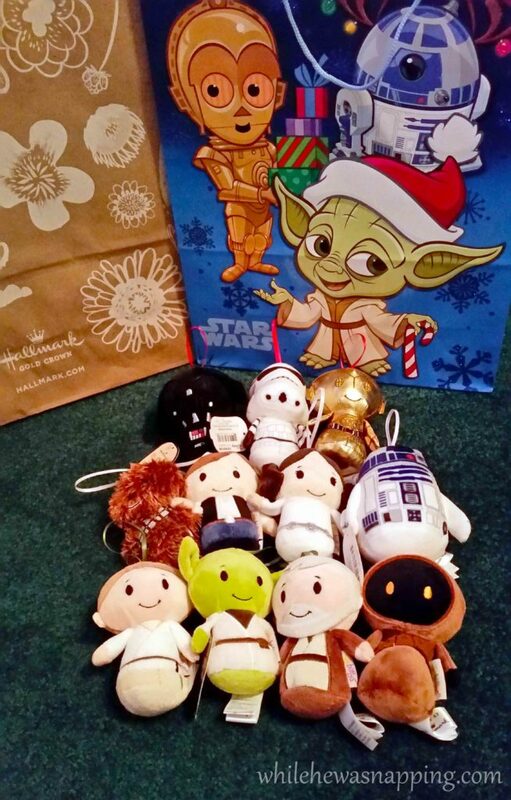 We seriously debated the Star Wars wrap, but went with the cute bag instead because well it’s just easier to wrap in a bag… And, of course, Hallmark has a fantastic selection of cards for your Holiday gifting. There are even Star Wars cards my boys would be crazy for. Your tree looks so cute! A fun tree for the kiddos. Ornaments that they can safely play with.Your Death Star looks quite real! Thanks, we really do love it! And the boys still play with them daily. That’s what I call a win!